The last few days have been so busy, we haven't had time to write anything on the blog.... and now we're having a few days in Queenstown staying with Cath's friends Alison and Chris and Billie (11) and Alfie (9) - otherwise known as the luckiest people on earth as they wake up every morning to the most spectacular view of Lake Wakatipu and the snow-dipped mountains around it - I just can't stop looking out of the windows (which were cleaned by Chris especially in honour of our visit, I'm told...). We're staying in the 'rumpus room' downstairs and the main rooms of the house are upstairs with huge picture windows facing the lake - sounding like an estate agent here, but it's just awesome. Queenstown itself is more of a village really but it's a lively, bustling ski resort, nestling on the beautiful deep-blue lake, full of winter sports tourists lugging snowboards around or having a beer by a roaring fire on the terrace of a bar - it's a cosy. friendly little place. Weirdly, it features on the map of NZ as a major town, so I was expecting it to be huge - but then again, many so-called 'tpwns' on the roads we've travelled have turned out to be hamlets of four or five houses. I still can't get over how sparsely populated the South Island is! Owen and I had a lovely day today - we went up the cable car ride to the top of a hill overlooking the town and the lake. with spectacular views of the Remarkables across the lake, which look like the spikey back of a sleeping dinosaur, capped with snow which forms snakey white riverlets down the folds of the mountains. At the top, we took the chairlift to the luge and had 2 goes on the luge runs, which was great fun. The slogan advertising it - 'once is never enough' - was written by Chris himself! Yesterday we went out for the day with the whole family in their minibus - they took us on a brilliiant hike up into the mountains to an old miner's hut - Sam Summers - a local legend who prospected for gold up there and only dies about 12 years ago. His hut is still intact and full of his mining tools. 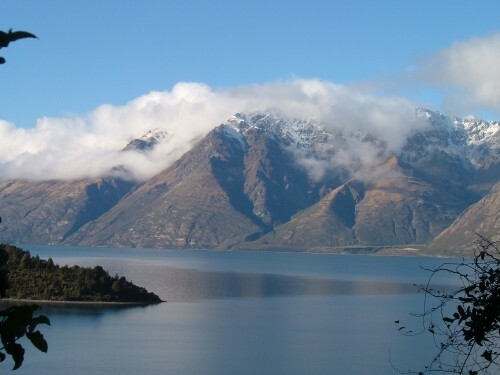 Then we carried on up the lakeside to Glenorchy, a lovely, peaceful little outpost where we looked in the possum fur shop and had a meal in a log cabin little cafe by the lake. (Possums are a major pest species in NZ, though ironically a protected species in Australia - they were introduced to NZ by early settlers to develop a fur trade but it's all gone horribly wrong and now they're out of control and the main predator of lots of near-extinct native NZ species...I hope to run one over during this road trip...). At Glenorchy, we went for a lovely walk round on eof the 'arms' of the lake, where black swans drifted against the backdrop of snow-capped volcanic cones reflected in the mirror of the water. Heaven! Sadly, we're leaving Queenstown tomorrow (Tuesday) for the long, 2 day drive back north up to Picton, aiming to get the ferry back to Welly on Thursday and the train back to Auckland on Friday. Really want more time on the South Island - there's so much more to see - but will have to come back here another time!